Although it was greeted with some surprise on its unveiling at this year’s E3, Tetris Effect has been a game long in the making. In the early 2000s, legendary game developer Tetsuya Mizuguchi attempted to get the rights to the genre-defining puzzle game, with the aim of creating a version of Tetris that featured the kind of interactive sound design previously seen in his previous game Rez. He was unsuccessful, leading him to create his own puzzle game: Lumines, which would itself become a classic of the genre. A good couple of decades later, Mizuguchi – alongside his new company, Enhance Inc. – has finally been able to bring us his take on Alexey Pajitnov’s classic. While in this day and age the idea of releasing a new Tetris game, especially at A$55, seems rather passe, it’s been a while since we saw an installment take such an artful stab at the game. The centrepiece of Tetris Effect is the Journey mode, a conceptually-minded trio of stage-based campaigns that escalate in difficulty. The Journey’s premise is simple: clear a set number of lines in each stage, to ultimately beat a more challenging final level. The execution is, however, an entirely different matter. The most immediately obvious twist is the game’s audio/visual presentation, awash in shimmering particle effects and shifting environments, paired with an impressively diverse soundtrack. This is par for the course for a Mizuguchi game, but it’s a revelation just how well this aesthetic meshes with Tetris, creating a mesmerizing and often instinctively evocative experience. This is enhanced by the variations in pace and intensity as you progress through the mode, with the game occasionally slowing down a tad to provide a modicum of relief after particularly hectic stretches of play. This is one of the first noticeable departures Tetris Effect makes from the classic formula, giving the game a sense of ebb and flow far different from the interminable upward ratchet of intensity we normally associate with Tetris. Likewise, each musical track evolves as you play, starting with random sounds and snatches of melody synced with the movement of your tetronimos, growing layer by layer into a full piece. 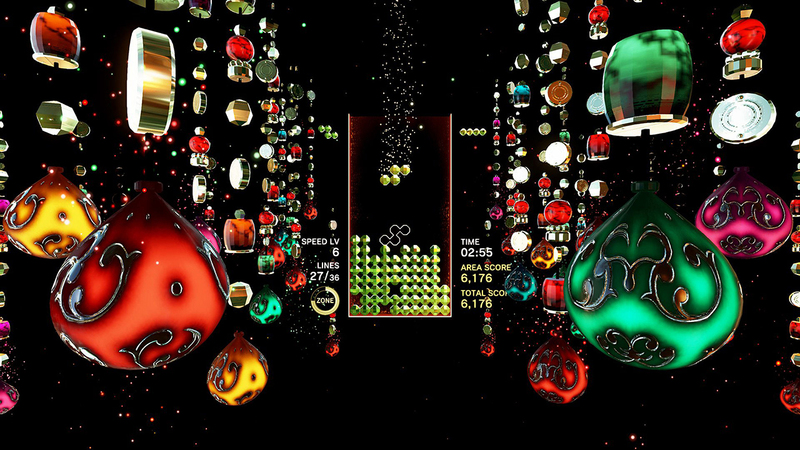 While classic Tetris has rewarded players with level or score, Tetris Effect rewards them with music. It’s an ingenious twist, only heightening the game’s hypnotic quality. You may start by simply playing a puzzle game, but by the end you feel like you’re conducting a virtual (literally so if you’re playing in VR) music piece. It’s a striking yet surprisingly natural-feeling experience that gives Tetris a new dimension of emotional satisfaction. Journey Mode’s innovations don’t stop there, though. It also introduces Zone mode, a kind of bullet time-esque state that can be triggered once its meter is filled. While in Zone, completed lines do not disappear but are ‘banked’ at the bottom of the well, the idea being to have as many as possible to clear as many as possible once the timer runs down for massive points bonuses. It’s tailor-made for racking up tetrises, complete with new names for cleared line numbers: ‘Octoris’ (Eight lines), ‘Dodecatris’ (Twelve lines), ‘Decahextris’ (Sixteen lines) and, if you can make it to twenty lines, ‘Ultimatris’. Zone mode also has strategic value when used defensively, for times when your stack is getting dangerously close to the top of the well and you need to slow things down and make up some space quickly. Overall, it’s a smart addition that goes even further to add depth to this now quarter-century old franchise. Naturally, Tetris Effect also comes with a raft of alternate modes, ranging from the traditional Marathon and score attack modes to more specific tweaks to the game. There are modes focusing on getting Combos and All Clears, or Target Mode and Purify Mode which have you clearing specific blocks in the field. Particularly fun is Countdown Mode, which forces you to play strategically to accommodate straight blocks that intermittently drop in random spots. The showcase mode here is probably Mystery mode, which randomly throws drastic changes in the rules and playing field. The well might suddenly flip to its mirror image, for example, or you might have to deal with a giant piece, which is usually impossible to slot neatly and must be built around. Just pray that the game doesn’t decide to flip the entire screen upside down (complete with reversed controls) at an inopportune moment, a trick that can break your run – and your mind – at the drop of a hat. Connectivity is also a huge part of Tetris Effect, especially on a thematic level. The superb soundtrack is full of references to humanity being connected and ‘in this together’, a sentiment that sounds gratingly cheesy on paper but is delivered with an infectious earnestness that gives the game a lot of its soothing effect. No-one could have guessed that ancient, Iron Curtain-spawned old Tetris would take to hippification so well, but it undeniably works like a charm. It’s also important on a mechanical level, with all modes including prominent leaderboards and a gorgeous globe-shaped hub screen with other players’ avatars floating around it. Weekly community events, or ‘rituals’, also give players the opportunity to earn new avatars by playing nominated modes. It’s another area in which Tetris Effect expands on the franchise, giving fresh-feeling new experiences to this most venerable of games. There are a couple of niggling faults: the mostly spectacular light show generated as you play can occasionally block the play field just enough to be annoying. Also, stages that involve pieces made out of non-standard items – cogs, for example, or gems – are a bit harder to read than the traditional blocks, and can lead to the odd annoying misplaced block due to the edges being less defined. However, these issues rear their heads rarely enough that it doesn’t break the experience. I should also point out here that while a lot of the hype around Tetris Effect has centred around its use with PSVR, I’ve exclusively been playing it in 2D and don’t feel I’ve missed out on anything significant. While it’s reportedly fantastic in VR, there’s also more than enough here for those of us not rich enough for a pair of Sony’s fancy-dancy goggles. Once again Tetsuya Mizuguchi demonstrates his genius, bringing us the strongest version of Tetris in years, and arguably one of the very best versions of the game ever. Tetris Effect may not be cheap, but it’s a triumphant must-play for fans of puzzle and music-based games. Cav reviewed Tetris Effect using a retail PlayStation 4 code purchased at retail.